Home » Blogging » New Here? Let me show you around! New Here? Let me show you around! 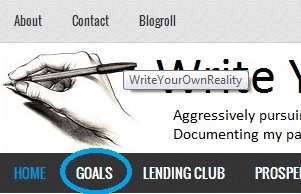 Welcome to Write Your Own Reality (WYOR), my little corner on the internet, where dividend growth, peer to peer lending investments, and some other random financial musings are the soup de jour. Rental real estate could be considered the oyster crackers of this soup, as a sprinkling of posts mellow out the flavor. As a note, if and when you get there, you might notice that my monthly update posts seem to be out of date and behind the times. This is true, as I took the summer off from blogging as my schedule and life cranked up quite a few notches. I’ve been catching up and should finish doing so in the not too distant future. With that being said, allow me to take this opportunity to show you around, and highlight some of my favorite areas of WYOR and some of the content I’m proud to call mine. If you click on any of the links, I’ve set things to open in a new tab or page so that you can refer back to here as you find places you’d like to visit. Before we get started on showing off the hardwoods and fancy wallpaper that is some of my content, let’s walk through the neighborhood and check out all the hot spots. Up top on my site you’ll find my About, Contact, and Blogroll pages. Nothing too fancy here, just a bit about who I am, why I am blogging, and some of my financial history. And if you’re looking for some great blogs to read, I recommend you check out the Blogroll. You’ll notice if you get a chance to explore some of the sites, the dividend growth community is quite robust, and my favorite peer to peer lending sites will rock your socks off with some serious education and research for any due diligence and questions you might have about investing. Not a whole needs to be said here, except that this is my favorite page on my site. NOTHING will keep you on track better than a quality set of goals. If you’re looking for some passive income inspiration, definitely check out my progress on my Goals page and follow along as I make progress and stretch myself to achieve more. I’m already planning for 2014 and boy, things are looking good to stretch me as I expand from just passive income goals into other facets of life and blogging. Goals are the cat’s meow and should be part of your financial toolbox. Following closely behind the Goals page as the favorite page on the site; the next three pages summarize the main focal points of this blog from an investment perspective. I am a huge fan of peer to peer lending, and as such, you’ll find all the details regarding my Lending Club and Prosper investments at the respective links. The Dividend Growth page houses a list of my current dividend growth holdings, and explains the purpose of why I created a dividend growth portfolio. The last three pages of the site focus on the financials of my unintentional rental property, listing out my monthly update posts for my investments, and any equity trades I’ve made. Peeling back the layers on my site is great, but you’re here to read, not check out my site design (got lucky with a great theme, I’m a total blogging rookie). Below is a listing of some of my favorite posts and what they are about. To DRIP, or not to DRIP, that is the question: This post discusses what it means to DRIP your dividend growth investments, and reasons for or against automatic reinvestment. While it is absolutely a personal decision, currently I have opted to DRIP my investments until I hit the $2-3,000 level in dividends received annually, from which point I will reexamine my decision. 2013 Passive Income Goals Revisited: After making it through the first five months of the year, I needed to drastically improve my goals for 2013. You will see how I’ve changed how I was investing, and where I needed to bump up my goals to make them more of a stretch to push me further. The Right Job – Turning Down a 30% Raise: This past spring I interviewed for a position outside of my current company, and ultimately decided to turn down a significant 30% raise by not making the switch. I utilized a set of criteria I developed to remove some of the emotions, thus allowing me to make a more informed and rational decision. Real Estate – Refinancing my Rental Property: This past spring after years of being unsuccessful, I was finally able to refinance my entirely unintentional and absolutely underwater rental property. Values have improved since hitting their low, but this is still a negative equity situation when considering selling costs. Fortunately, refinancing helped take some of the pain away from the monthly negative cash flow as I was able to save over $4,200 per year! Peer to Peer Lending Investment Criteria: Both my Lending Club and Prosper investment criteria were developed after spending hours tweaking and researching different credit models utilizing both company’s loan history. If you are looking for a starting point or a place to ask questions, be sure to check these two posts out. Well that does it folks, welcome to Write Your Own Reality! 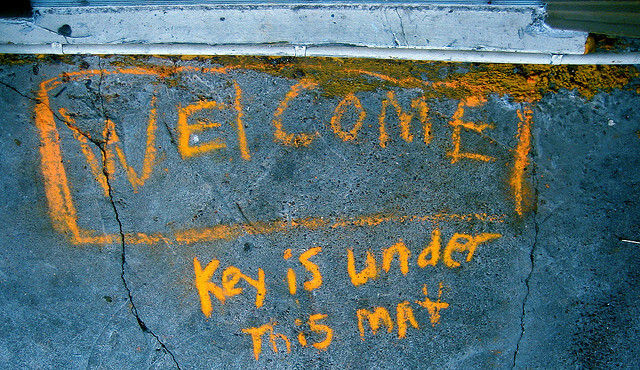 Please enjoy your stay and feel free to ask questions below. If you’re interested in receiving updates on new content, you can follow me on Twitter and Facebook, as well as subscribe using the field near the top of site on the sidebar. Thanks for writing up this tutorial. I’m definitely enjoying the site and articles –particularly the one on turning down a a big pay raise. That’s tough to do, but you’re right, you can’t put a pricetag on the environment/work culture. I left my old company b/c I knew I didn’t fit in with the people, even though the old place had outstanding bonus programs/benefits. I might make less now, but am a lot happier b/c I get to work with laid back people who fit my personality. If was still stuck at that old place… I probably would have had to find a way to pull in early FI even earlier… not even sure if that would even be possible. Looking forward to more great content! Thanks for stopping by FI, as well as the compliments! The job decision was probably one of the toughest decisions I’ve made professionally, and thus far it has worked out for the best. Money isn’t everything, and decisions cannot be based on that one aspect alone. Found your site through 1500 Days and am so excited, as one of our goals is to delve into the world of (primarily passive) investing. Looking forward to reading the great stuff here – thank you! Glad you found me Laurie, and I look forward to writing that content! Feel free to let me know if you have any questions. I read your article on rents, I’m a huge fan of rental properties. If I was negative cash flow I probably wouldn’t like it as much. I always enjoy seeing other’s passive income growth. You’re absolutely right Charles, not much to like about cash flow negative properties. W2R, Looking forward to seeing run down more of your goals through the remainder of this year and into 2014!. Thanks for the support Integrator, and looking forward to running those goals down myself!